To hear Cary Clark talk about becoming a veterinarian, you would get the impression that it was the most natural thing in the world. Many people love animals and want to care for them, but when your great great-grandfather was the first dean of the Auburn University College of Veterinary Medicine, it becomes a family affair. Cary Clark examining a pet while on fourth-year clinical rotation. “Ever since I was little, I’ve wanted to be a vet. I grew up surrounded by house pets and I was always interested in science, especially genetics. Dr. Cary’s legacy was definitely a factor too,” Clark said. Dr. Charles Allen Cary is a renowned figure in veterinary medical history: referred to as the father of veterinary medicine in the South, as the first dean of Auburn’s veterinary medical program and for his contributions to human health and the veterinary profession. He has been. Clark’s parents also played an instrumental role in her decision to follow her dream, encouraging her to become a veterinarian so that she could take advantage of the opportunities to travel and participate in events nationwide, while still maintaining a stable family later in life. Though she grew up in Hampton, Va., Clark said she has always felt connected to Auburn. Her mother grew up in Auburn, and her maternal grandparents have always lived here, and she visited often. When the time came to choose a college to pursue her undergraduate degree, Auburn was the natural choice. She quickly became immersed in her collegiate career, attaining membership in the Honors Program and Kappa Delta sorority. 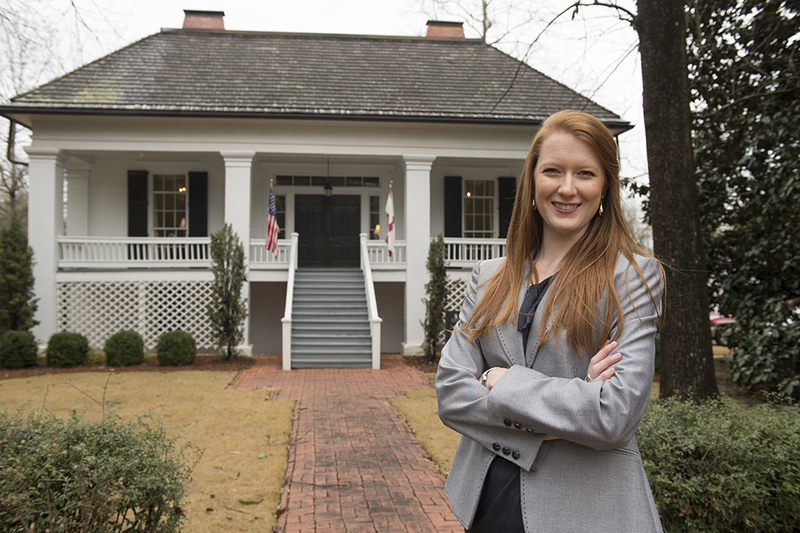 After receiving her bachelor’s in zoology in 2011, Clark decided that she would continue on to the College of Veterinary Medicine, and continue her family’s legacy at Auburn. Clark’s passion for Auburn becomes obvious as she speaks, her voice joyful as she talks about being the first one from her class to get into the College of Veterinary Medicine. Clark said that she was initially apprehensive about how being the descendant of the first dean would be perceived by her peers, worried that others might think her family connection was her only gateway into the college. Clark in front of the Cary Home, where her great, great grandfather, Dr. Charles Allen Cary, lived. It is now the home of the Cary Center for the Advancement of Philanthropic and Nonprofit Studies at Auburn University. And though she kept it to herself, a few people eventually found out. Within her first semester though, any doubts she had were laid to rest through hard work and devotion to her studies. As a graduate of the class of 2015, Clark is pursuing a career in private practice in the Atlanta area and plans to continue her education in a specialty service. 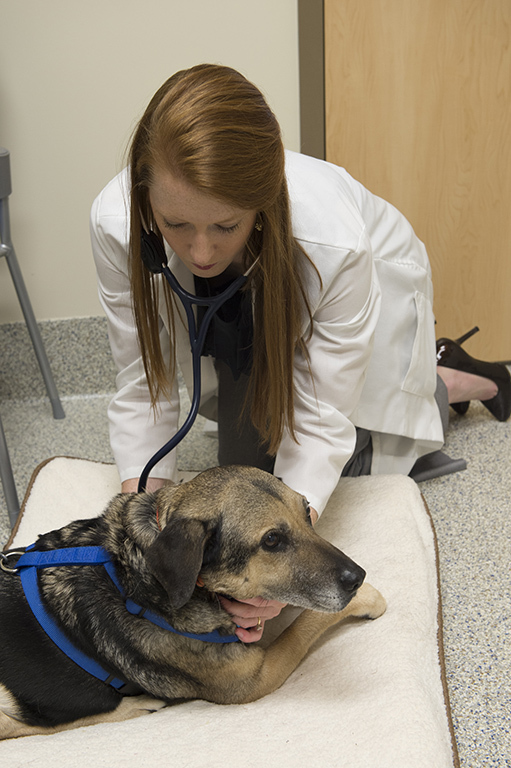 Clark is also becoming involved in the national and state veterinary organizations. “That is a big part of Dr. Cary’s legacy, and it’s important to me, being a part of professional organizations and taking leadership in roles that link me and my peers together,” Clark said. “The thing I value most about having been at Auburn is the friendships I’ve made. I’ve met so many wonderful people and made friendships that will last. It’s not something you can find just anywhere,” Clark said. “The opportunities I’ve had with organizations in the college, like SCAVMA, have allowed me to travel across the country and attend these great events, and I appreciate that. Born and educated in Iowa, Dr. Cary taught the first veterinary science course in 1892 at what was then the Alabama Agricultural and Mechanical College, now Auburn University. A year later, he was appointed professor of physiology and veterinary science, as well as experiment station veterinarian. In both capacities, he was remembered as a dynamic teacher. He became Alabama’s first State Veterinarian in 1905, during which time he led in establishing meat and dairy inspection laws. In 1907, he was named dean of the newly established College of Veterinary Medicine at Auburn, the first such school in the South. He held that position until his death in 1935. Dr. Cary was president of the Alabama Veterinary Medical Association, the Alabama Livestock Association, and the United States Livestock Sanitary Association. His campaigns to eradicate bovine tuberculosis and Texas tick fever were among the many accomplishments that led to his recognition as the Father of Veterinary Medicine in the South. In Alabama, he was recognized for his fight to rid Alabama livestock of fever ticks and for his research and practical applications on brucellosis and tuberculosis testing. He established Saturday clinics and summer institutes, teaching farmers about the prevention and treatment of diseases of animals. In 1896, he helped to establish in Montgomery the first meat inspection system in the United States, following that up with meat and milk inspection ordinances in all major Alabama cities. Dr. Cary also made huge strides in advancing veterinary medicine as a professional field, securing legislation to regulate the veterinary profession in Alabama, and establishing educational and licensing standards that would guide the veterinary profession in Alabama for decades to come.